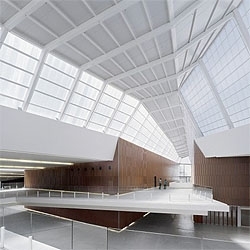 The new Granada Science Park by spanish architects Ferrater + Jimenez Brasa features amazing interior spaces, flooded with natural light. 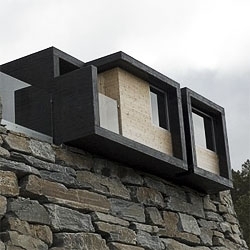 The exterior is a complex topography that blends with the surrounding mountains. 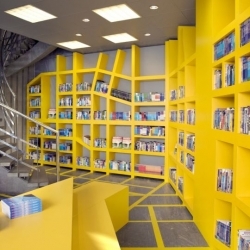 Swedisk Smånsk has redesign the magazine Vagabonds travel bookstore in central Stockholm. A map of the local area provides the basis for the floor pattern, which continues up the walls in the form of a shelving system. 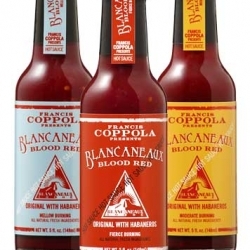 Francis Ford Coppola's new Blancaneaux Blood Red Hot Sauce. 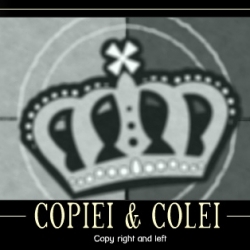 Available in 3 degrees of Heat. Mellow, Moderate and Fierce Burning. Visit the MANGIA! 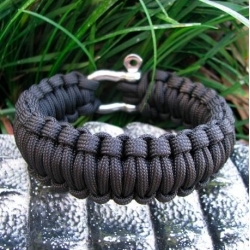 section of the online store to find. 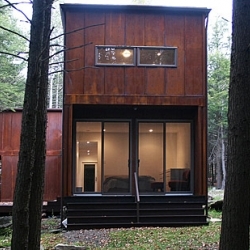 Control more C and Control more V.
Weehouse is a St. Paul firm offering a range of minimalist prefab houses starting at $65,000. 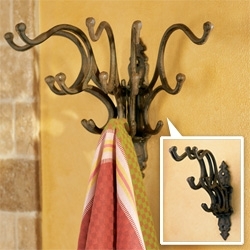 All the models are based on pre-insulated modules, which can be combined in various unexpected ways. 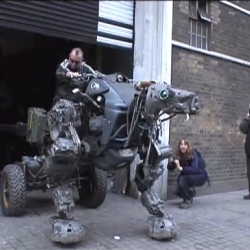 A giant, firebreathing robot dog roams the streets of London! 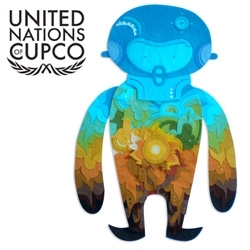 Courtesy of our steam-punk friends Mutoid Waste Company. 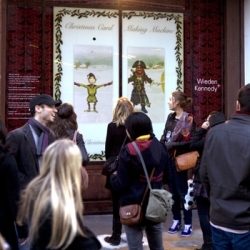 Wieden and Kennedy London have created a Christmas Card Making Machine in their front window. It works by taking a picture of your face and placing it randomly onto one of the 12 Christmas characters which is then uploaded immediately on to the site. Find your face online and email your very own personalised christmas card to your loved ones for free! 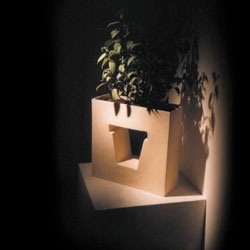 I like this inverse pot called Terra, by Umamy. 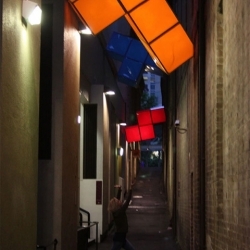 These massive falling Tetris block sculptures might be found somewhere on the streets of Australia. 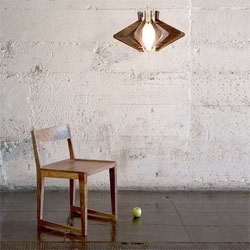 Beautiful, eco-conscious wood furniture from A Single Tree. The “ICE TREE” by Paprika for Domison - Montreal’s furniture store DOMISON has commissioned the design firm Paprika to create a magical Christmas window installation. 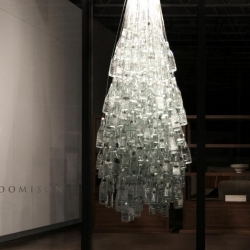 Over 300 bottles are hung at various heights to give the random shape of the tree. 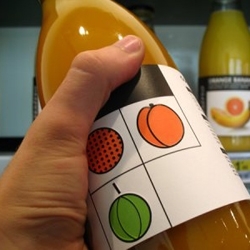 Each bottle is filled with a DOMISON logo. The end result is a floating enchanted winter creature. Love this amazing print by Tugboat Printshop. 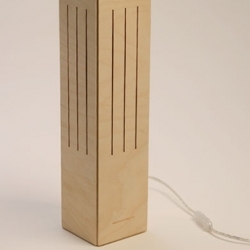 A wine case that turns into a lamp that turns into recyclable waste. 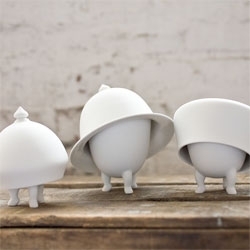 Jorine Oosterhoff's playful Mad Hatter tableware. Love the oversized lids. FEATUREDGift Guide ~ NOTCOT Wishlist ~ aka a rant on gift guides this season and a collage of many random products that i've been craving that haven't made it on my other guides so far! 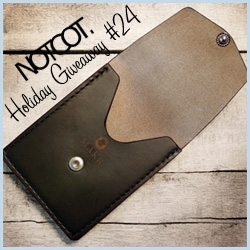 FEATUREDNOTCOT Giveaway #24 ~ Makr is giving away one of their handcrafted leather wallets ~ the Black Tonal Plaid Vertical Pocket to be exact! 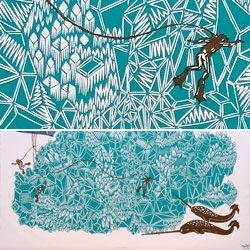 four new prints by freshlyblended press, 2 prints are two color letterpressed at 8x10" and 2 are two color gocco prints at 6x8". 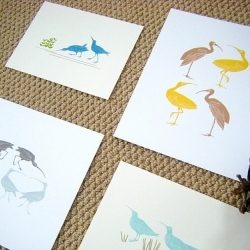 All the prints are printed on eco-friendly papers with lots of tender loving care! 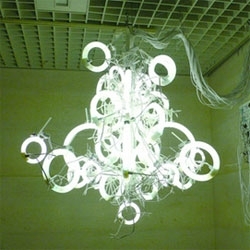 Yuichi Higashionna's fluorescent light sculptures. 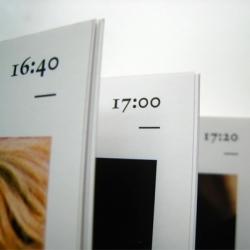 A review of 'A Day at El Bulli' by Ferran Adria, published by Phaidon. 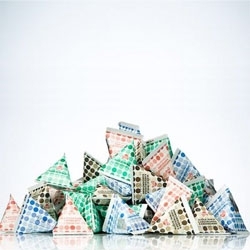 Neumeister designed these mini milk packets for Arla - they are way cooler than your typical diner half and half! 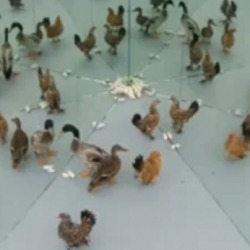 VIDEOlarytta - souvenir de chine - video directed by körner union ~ so bizarre, so fascinating, like a giant kaleidoscope, only with huge mirrors and live mice and various birds running around terribly confused. 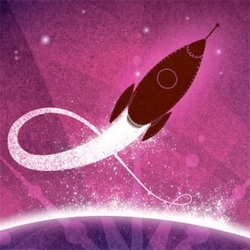 Arnaud Kermarrec-Tortorici and Fabrice Pellé are the duo behind l'Illustre Fabrique ~ incredibly beautiful posters and illustrations! Video for Stay the Same from French group Autokratz. "Stay The Same" available on the mini album "DOWN & OUT IN PARIS & LONDON" and KITSUNE MAISON 6 COMPILATION. 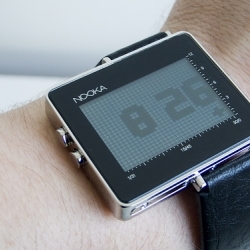 Nooka Zon -- One function displays the time in big digital numbers while the other way shows time in squares. 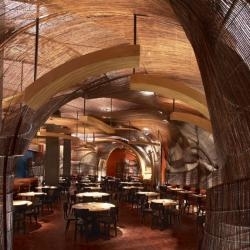 Nobu has recently opened a new restaurant, this time in Dubai, with an interior designed by the Rockwell Group. 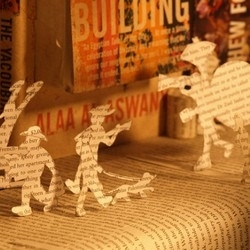 This is where we live - Fantastic stop motion created entirely of books. 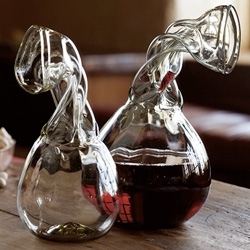 Knight's Decanters ~ apparently back in the day they were made so they could sip horseback without spillage... love Josef Flek’s modern interpretation! 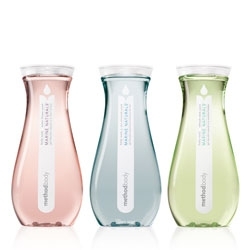 Method has launched a new line of body washes - always with pretty packaging! 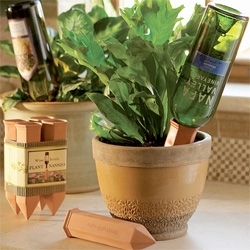 Wine bottle plant nannies ~ the age old concept of letting the plants absorb only the water they need, as they need it through the terracotta ~ only this time it's also a fun way to reuse your fav wine bottles! VIDEOZero Gravity madness on the new National Geographic Channel Idents for Space Week, filmed in a G-Force Airplane used to train NASA astronauts. Lea Turto from Finland has made Plastic Garden. 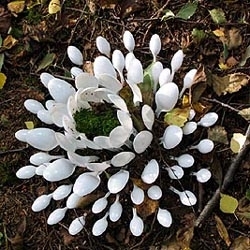 Here is the iCty-fFower installation of plastic spoons. 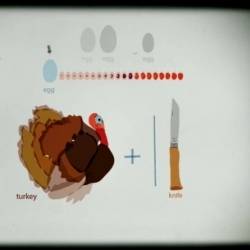 "Fermer les yeux pour voir" proposes a new tactile and graphic language which takes everybody’s needs into account : blind people, partially sighted people and sighted people. 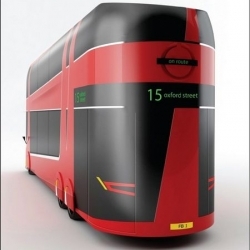 Proposed redesign of London buses. 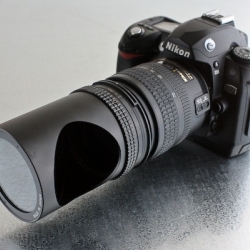 Super-Secret Spy Lens: In short, you can shoot left, right, up, or down (it swivels 360 degrees), all while appearing to shoot straight ahead! The textural experience of Danish designer, Ditte Fischer's work is almost as important as its visual appeal. 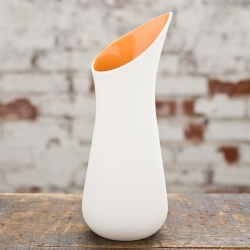 The outside is soft-sanded dyed china while the inside is finished in beautifully colored glossy glaze. 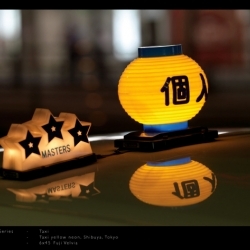 Taxi series, shot recently in Tokyo,New York, Shanghai,Hong Kong- all presented 'as shot' with no post production or cropping. Shot on Hasselblad medium format film & digital capture, all handheld. 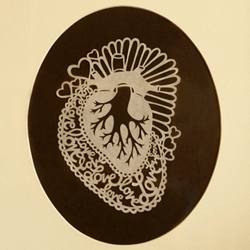 Fragile and elegant paper cut out art by Lala Gallardo. Check out her etsy on littleghosts.etsy.com. 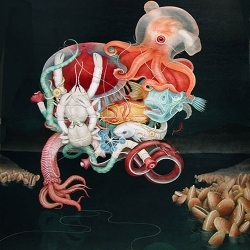 Gorgeous paintings by Tiffany Bozic. 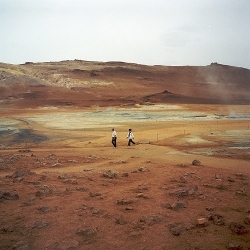 Some beautiful shots of Iceland by American, Peter Baker. 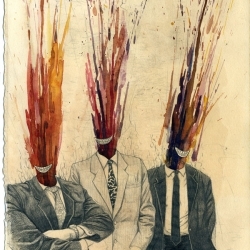 achariah Johnsen, is a young artist who specializes in watercolor, pen & ink, and mixed media works on paper. 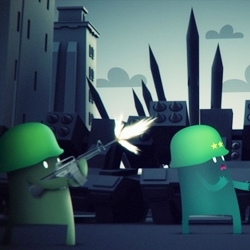 The Wyld Stallyons combine 2-D and 3-D animation in their new music video for an Irish indie band "The Blizzards". 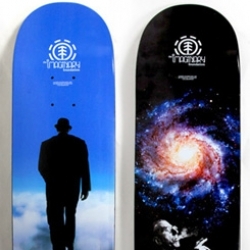 'Trace a face' is a collaboration between konst & teknik and jonathan puckey. 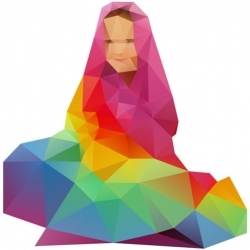 13 fellow artist and designers were asked to trace a face using the 'delauney raster', a custom-written image vectorization tool for adobe illustrator by puckey. 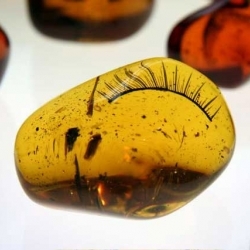 Amber fossils from the future created by the Glue Society for last week's Pulse Contemporary Art Show in Miami. The new toilets at Aurland, Norway by Todd Saunders & Tommie Wilhelmsen, have one of the most spectacular views a toilet will ever have.